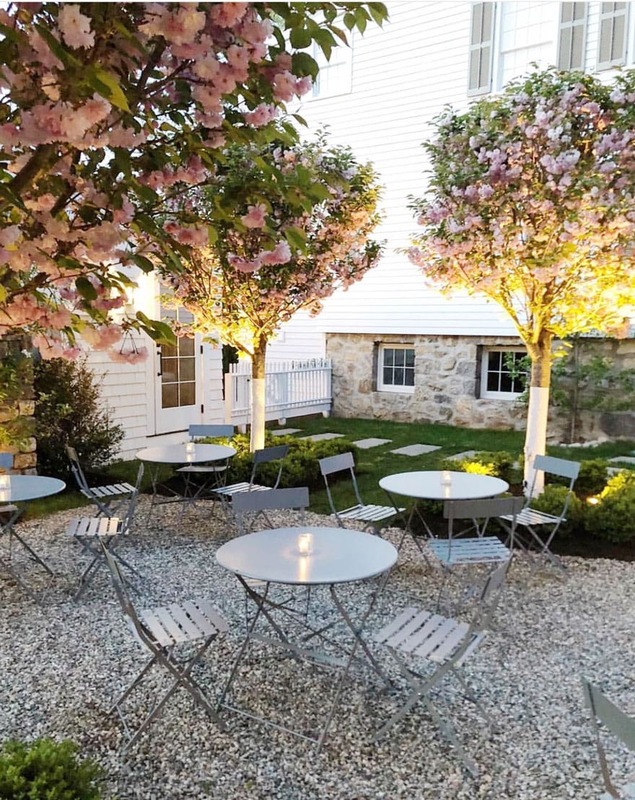 Garden Seating at GrayBarns when the cherry trees are in bloom. GrayBarns was once known as the Silvermine Inn and Tavern. 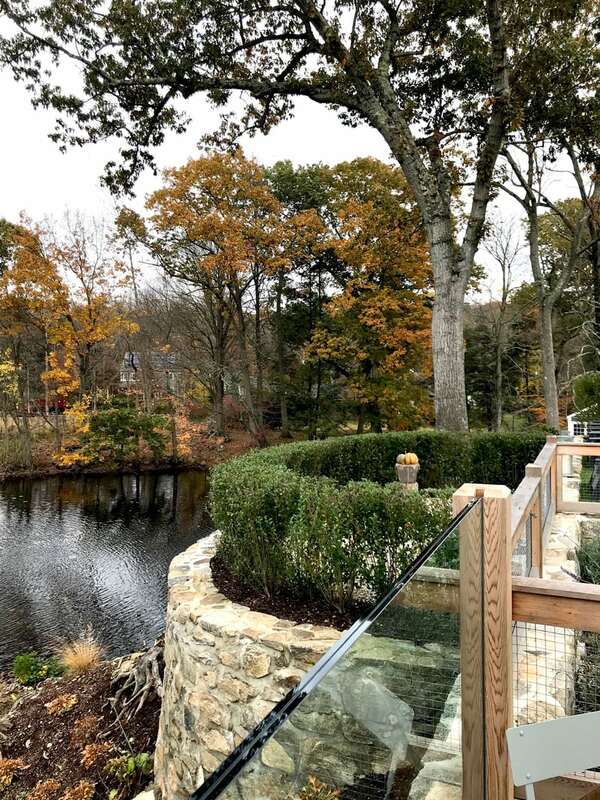 It’s located in the Silvermine area, which is at the edge of New Canaan, Wilton, and Norwalk. It has a long history as a meeting place for local artists dating back to the early 1900s. The Silvermine Inn was owned and operated by the same family until 2009. It closed for a few years and was purchased by Marcia and Andy Glazer. It re-opened a few months ago and I don’t even know where to begin. 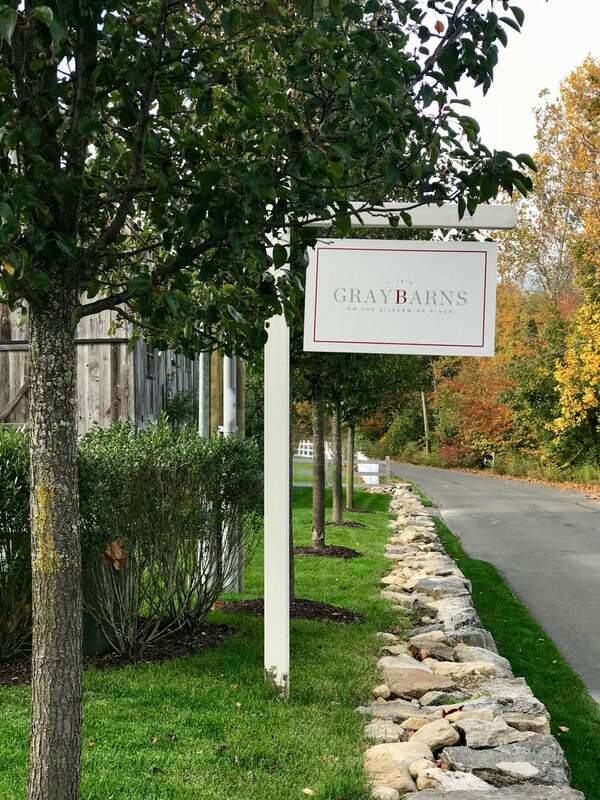 GrayBarns is a small group of homes, an events barn and the GrayBarns Inn and Tavern. Soon there will be a mercantile which will be part shop and part coffee bar. 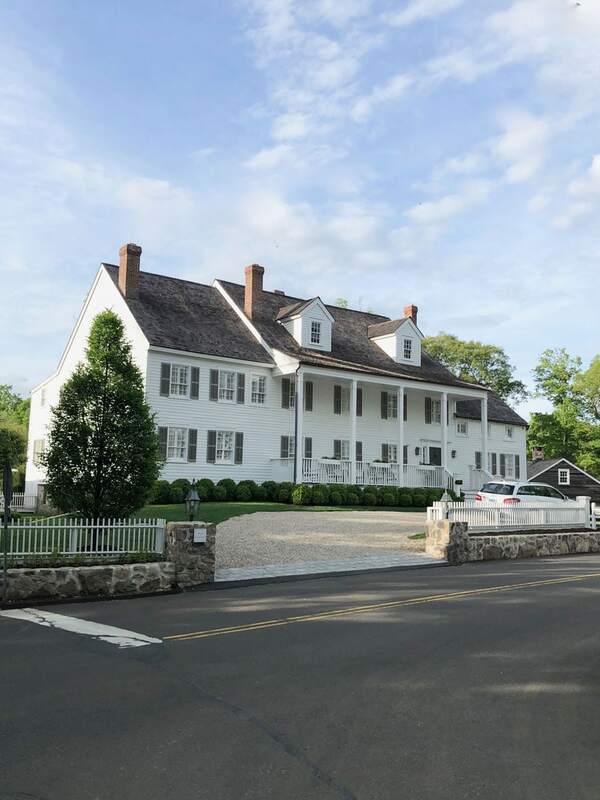 When we first moved back to New Canaan after three years in California I remember driving by the old Silvermine Inn and I heard it had closed. But the old Mill House adjacent to the inn had been beautifully restored. It wasn’t until I saw the article in CTC&G that I realized it was the owners/developers of the Inn. 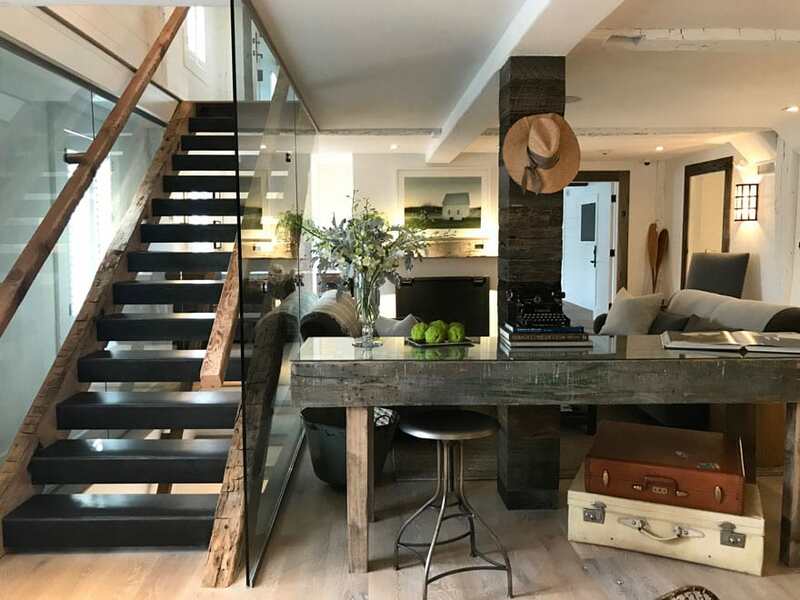 The Glazers wanted to live on site so that they could oversee the project and make the hundreds of decisions that it takes to create such a beautiful place. Last Friday I saw on their Instagram that they would be hosting a Pop Up Bakery in the Barn so I made certain to stop by just as they opened. 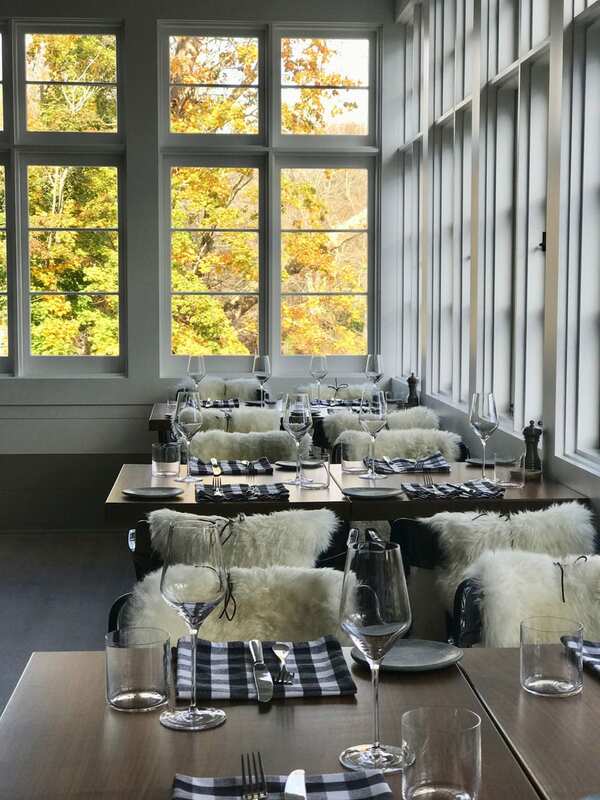 There was a line out the door, but I had the chance to chat with owner/designer Marsha Glazer and she gave us a little tour of the Inn and Tavern. Marsha’s approach to designing GrayBarns was to save what could be saved and improve every area even if that meant relocating stairways and moving walls. 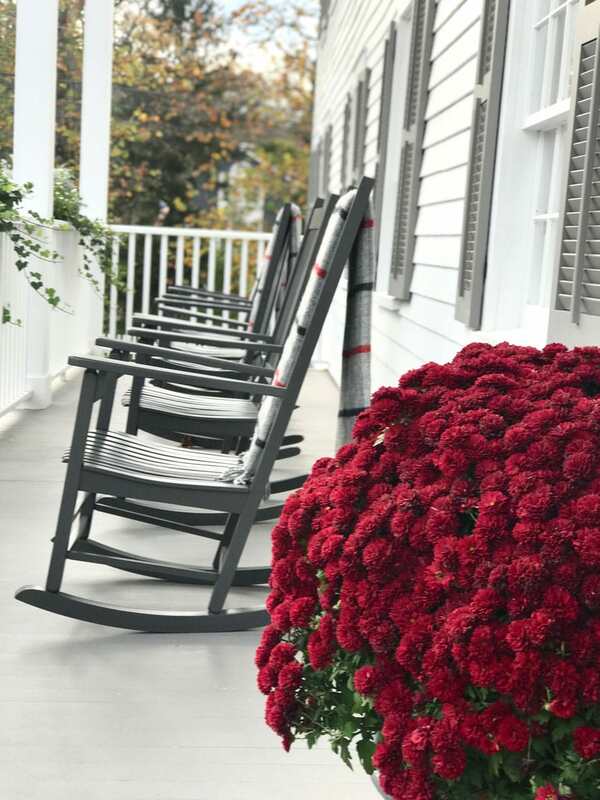 GrayBarns has six beautiful guest rooms. Each is a king suite with a living area and separate bedroom. Much of the furniture was made on-site for a particular space. 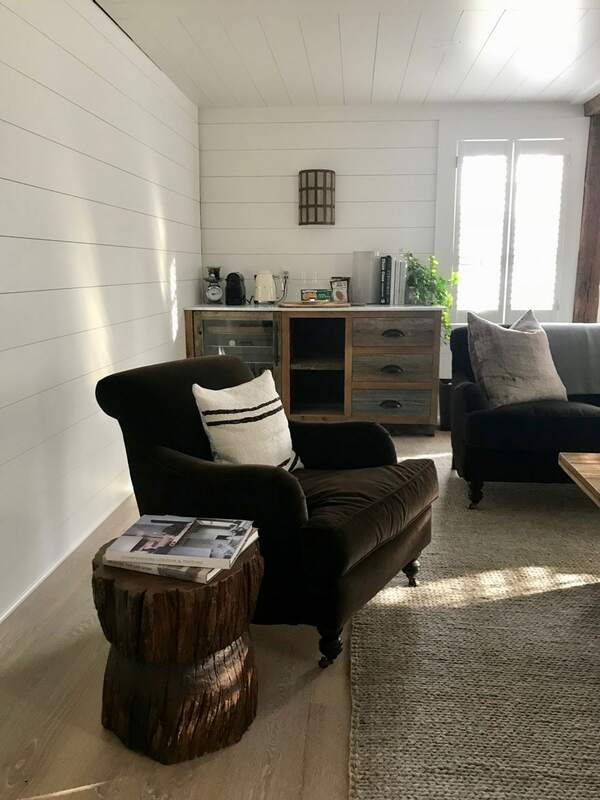 Marsha explained that the need for a little extra seating in one room resulted in using leftover fabric to create little poofs along side a custom coffee table. 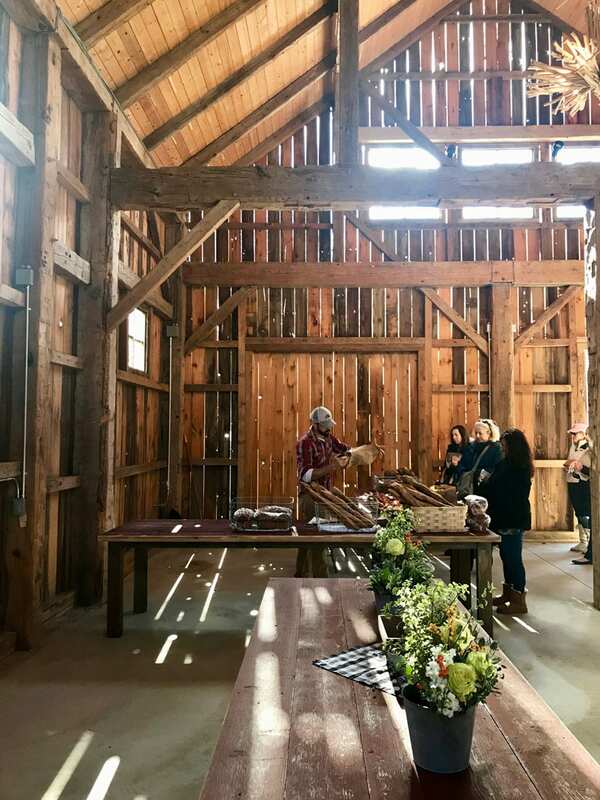 Each room has a wet bar constructed of barn wood. A Smeg tea kettle and Nespresso along with every other item you might need to make your self as comfortable as home has been well planned out for your visit. Every detail has been considered for comfort and design. The old fashioned alarm clock sits next to a more modern convenience from Rejuvination, an extension cord with USB. 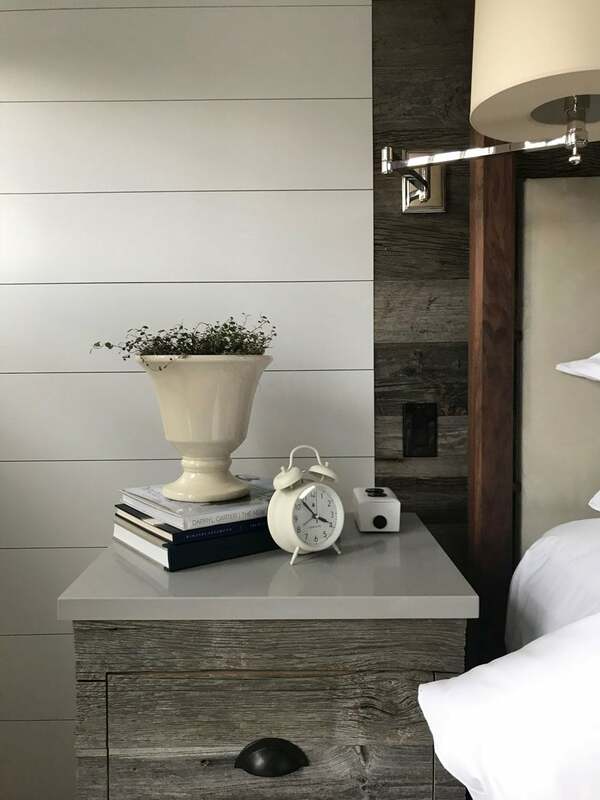 The lobby, the restaurant, and each guest room includes gorgeous lighting, planked white or barn wood walls, and luxurious upholstered furniture in crisp white slipcovers or rich dark velvets. 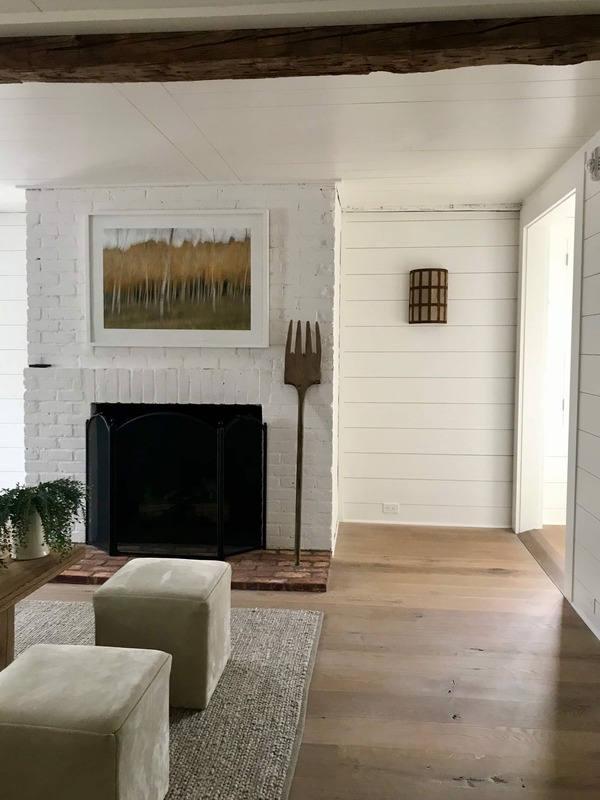 A few antiques, books, fresh flowers, artwork over painted white brick fireplaces fill each space in just the perfect way. Every detail is well thought out about how and why it functions. In the restaurant, Marsha explained that they knew they wanted a large table that served purpose in the dining room. 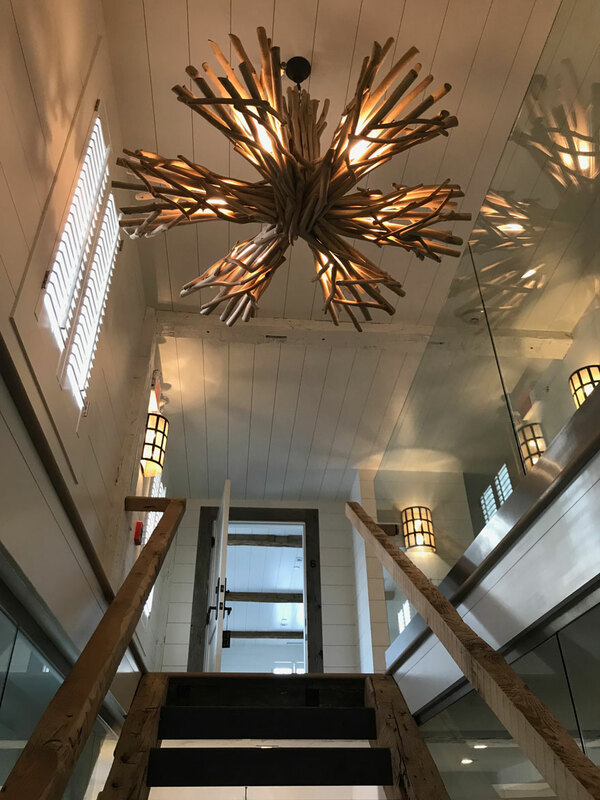 They ended up using wood they had salvaged and created a custom one-of-a-kind piece that suits their needs perfectly. Wood slats were added under the table to create wine glass holders. On top a large piece of marble holds huge buckets to hold the wine. The small ceramic numbers keeps track of the wine by table. 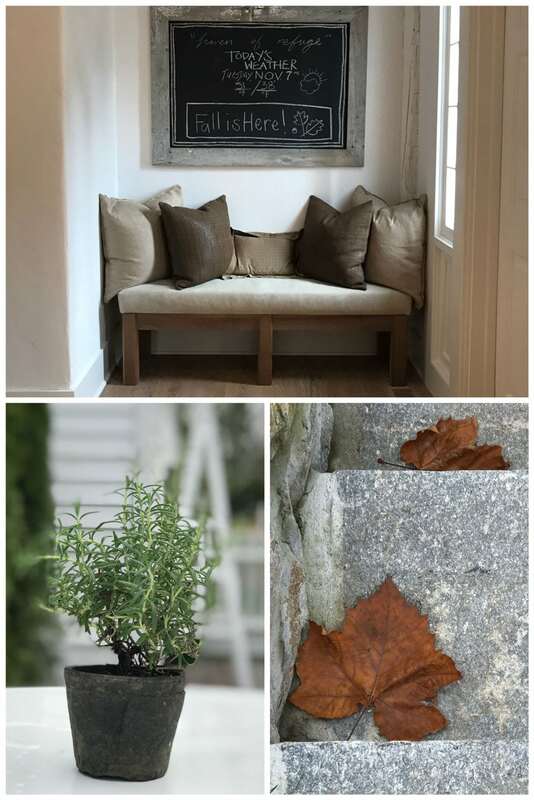 The Silvermine Inn is the perfect get away from New York City. 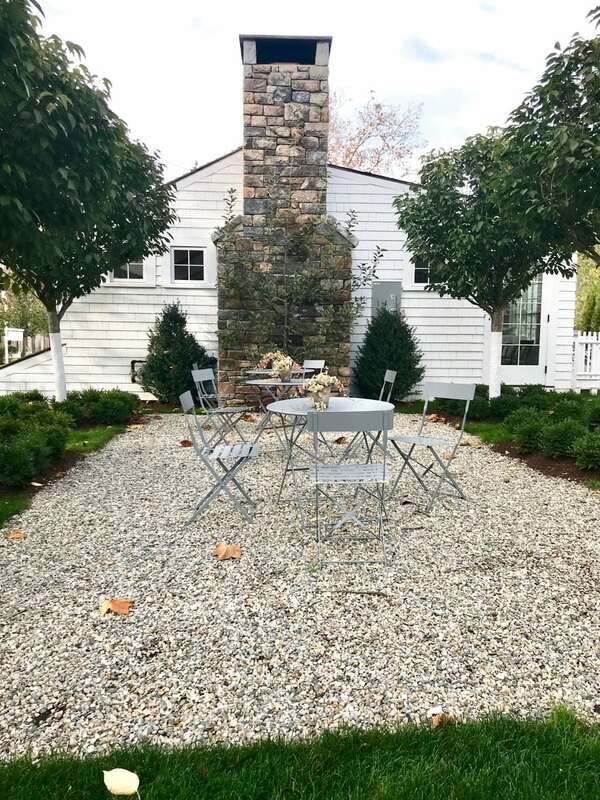 Located just 49 miles from Grand Central Terminal, a little over an hour by car or take Metro North to New Canaan which is about an hour and then travel 10 minutes by taxi to GrayBarns. 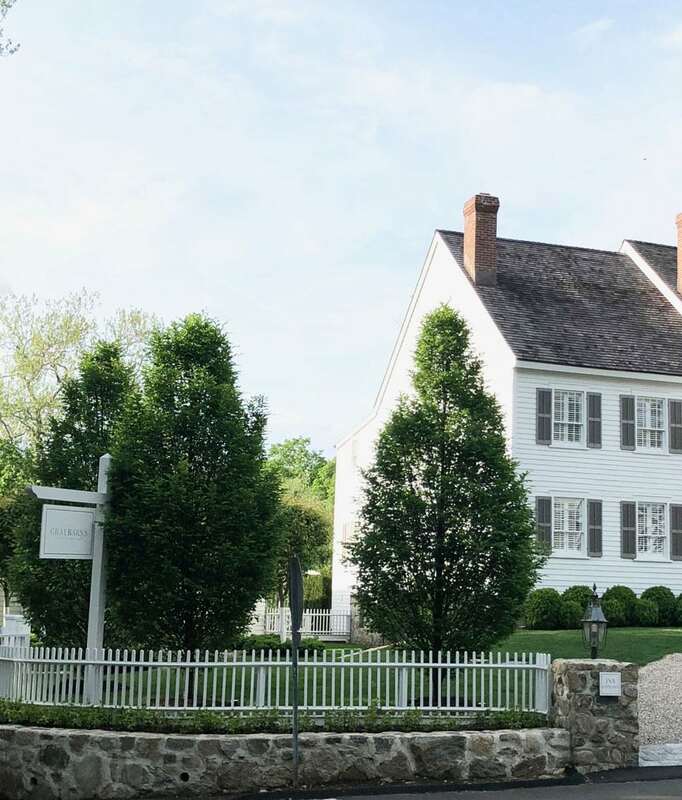 Once you arrive, you will probably not want to leave, but should you decide to venture out, the Town of New Canaan is only 3.5 miles away and has shops, galleries, a movie theatre and restaurants. 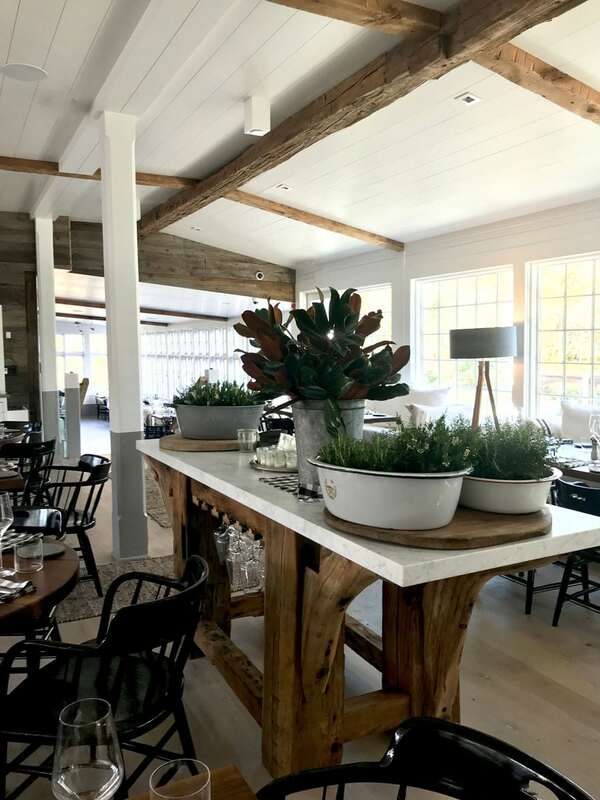 You may want to check out Grace Farms (We wrote about Grace Farms here) and The Glass House while you are in the area. But if your only stop is GrayBarns, you’ll have a wonderful experience. It’s truly a masterpiece.